Why not visit us and browse our wide range of quality products. We have ready made food hampers and bags in different sizes. Choose from a mixed selection of goods, or perhaps a more specific selection such as olive, cheese or fruit baskets. 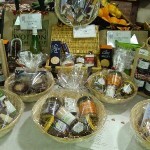 Alternatively you can choose your own items and we’ll wrap them for you in a hamper, re-usable eco-bag or basket. 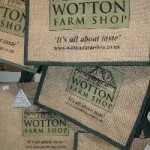 Wotton Farm Shop Gift Vouchers are also available in various denominations. We have a range of plants and pots, and in Spring offer a renowned hanging basket service. Complement your gift with one of the many cards produced by local artists Jane Lampard and Claire Failes.